The recipe for Black Magic cake has been around forever and is, understandably, favored by many. It is incredibly moist and soft, has a deep, rich chocolate taste and is nearly impossible (at least for me) to resist. The recipe I use comes from Allrecipes, where lots of folks have LOTS to say, so the reviews are many. I prepare the batter exactly as instructed, and I’m happy with the results. I baked the cupcakes in two batches, and found that the first batch did sink a little on top (you can see it in this photo), but the second batch didn’t sink a bit. It may be because either a) The batter sat for 30 minutes or b) I filled the papers with more batter the second time around. In any case, they were equally delicious. Now, let’s talk about the frosting. I had heard about a buttercream made from a cooked paste of flour and milk and thought, “nuh uh, no way”. In my world, buttercream frosting is made of confectioners sugar, butter (maybe a little white shortening too), vanilla, milk or cream, and a touch of salt. Flour??? Nope. Granulated sugar??? Wrong. And then….my period of enlightenment. I found a flour/milk recipe (along with a great tutorial) at The Pioneer Woman and, when she declared it “positively unbelievable”, I thought “we’ll see”. And “see” we did. How could cooked flour and milk, mixed with granulated sugar, butter and vanilla produce the most divine frosting I have EVER eaten? Wow. I had just enough to cover 24 cupcakes, but I’m certain it would have gone a lot farther if I hadn’t eaten half of it for dinner. It is similar in consistency to the center of a Drakes’s Yankee Doodle cupcake, but tastes a million times better (okay, maybe a half million). I read a suggestion to cover the cooked paste with plastic wrap as it is cooling, which will help eliminate the slight crust that forms on top (sort of the same thing you get when you’re cooling cooked chocolate pudding). I’ll try that tip next time, but I did not mind, nor really notice, the tiny firm bits that were dispersed throughout. 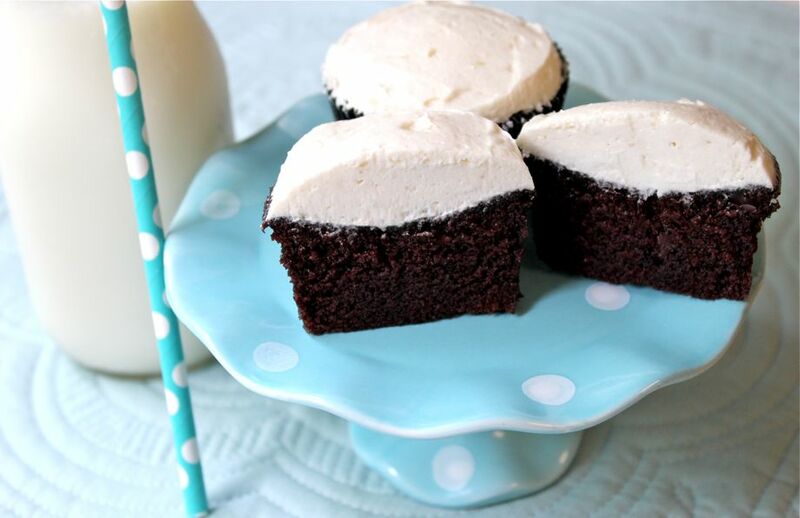 This cupcake/frosting combo is one that I vow to make again, and again. And again. Next time, I’ll dump the frosting into a piping bag to see if I can make them a wee bit more attractive. If it doesn’t work out, they will remain simple…and totally delicious! Yummy enough to eat two-at-a-time, and wish for a third. Thanks, Holly! Years ago my mother-in-law gave me a recipe for a sour cream banana cake with that same cooked frosting. It’s so delicious, much better than standard buttercream icing! Did you use unsalted butter? Hi Carol! I agree…much better tasting than standard buttercream, but I’m not sure that it would pipe as well. I did not have unsalted butter on hand, so I used salted and the results were great. I’ll have to get that sour cream banana cake recipe from you…sounds yummy!!! Friends have told me that this is a recipe they remember their moms using a while back. I think it was very popular at one time, but maybe not so much now. I didn’t expect to love it as much as I did, but it is wonderfully delicious…not too sweet with a soft and fluffy texture. I imagine it’s the perfect complement to Red Velvet Cake. Thanks for taking the time to comment. Wishes for a happy holiday season!